Are you a fan of interior design? Come support a nonprofit collaboration with ASID Interior Design Students as they create beautiful 12 x 12 vignettes all from recycled and donated items. On April 12th students will reveal the rooms to the public, and all items used in the student designs will be silent auctioned to support the no-fee Anaheim Adult Rehabilitation Center of The Salvation Army April 12th- the 19th at Salvation Army Family Stores in Orange, Huntington Beach, and Fountain Valley. For more information please visit Anaheim.SAtruck.org. We all know someone who has struggled with addiction. Your physical donations to The Salvation Army help directly. When you drop-off donations or call for free donation pick-ups at 1-800-SA-TRUCK, you help provide no-fee shelter, emotional and spiritual counseling, food, and programs that help 175 local men and women overcome addiction to drugs and alcohol with 84 cents of every dollar raised. Change a life today, schedule a free pick-up please call 1-800-SA-TRUCK or online at Anaheim.SAtruck.org. What is Noah’s ARC? Take a look at our 2013 slideshow and see how local students transform donated materials into treasures! "That's right, a post that wasn't music related, lol"
Though it does feature some music from "Sleepy Kitten"
Music fans worldwide are saying, what is "Sleepy Kitten"? I have had more emails this morning about this new album than ever before, and I am thrilled to introduce it right to you myself! "Sleepy Kitten" by Danny Hauger now streaming on Spotify for free!! 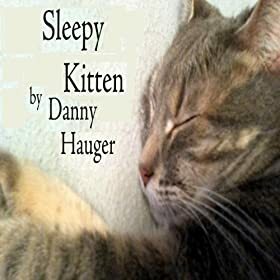 "Sleepy Kitten" is the newest worldwide release from Danny Hauger music. It features some new alternative rock tunes, some acoustic tracks in the modern rock style, and even some instrumental songs. The album features a full hour of new and newly remastered songs. Be the first one of your friends to have Danny Hauger music in your iTunes! New Album Sleepy kitten by Danny Hauger Out this week! Now on Amazon! "Sleepy Kitten" by Danny Hauger Music!! Enjoy downloading track 2, "I didn't want to love you" right here, free on this podcast!